Last month, I added a show nearby train station feature to my train app Rapidly . I've stumbled across few issues while following some online tutorials on how to implement Core Location 😅. In this post we will look into how to retrieve current location of user using Core Location and troubleshoot some common issues. 'didUpdateLocation' didn't get called even after I have set delegate! What happened? Before requesting location data of the user, we will need to request permission to use location service from the user. We can request location permission by calling .requestWhenInUseAuthorization() to get location data when the app is active, or .requestAlwaysAuthorization() to get location data when the app is active or in background (this is how Waze / Google Maps can continue get your location data even when they are in background). One thing to note before requesting permission is that we need to specify the reason why we are requesting to use location data of the user. We can specify the reason inside the Info.plist. In the Info.plist, hover any row and click the "+" button. Then type in '"Privacy - Location" and use the autocomplete to select the correct key from the list. If your app need to support iOS 10 and earlier and require always authorization, you will need to add the key Privacy - Location Always Usage Description together with the 'Privacy - Location Always and When In Use Usage Description ' . If you are not sure if the key you have typed in is correct, you can view the source code of Info.plist and input the Key manually. Right click 'Info.plist' and select 'Open As > Source Code'. The keys are NSLocationWhenInUseUsageDescription, NSLocationAlwaysAndWhenInUseUsageDescription and NSLocationAlwaysUsageDescription (for iOS 10 and earlier). This alert will be shown after .requestWhenInUseAuthorization() or .requestAlwaysAuthorization() is called for the first time (when user haven't tap 'Allow' or 'Dont Allow'). After user tap 'Allow' or 'Disallow', the delegate method didChangeAuthorization status: will be called. One thing to note is that this delegate method (didChangeAuthorization status) will always be called after the line locationManager.delegate = self, even when the permission dialog haven't been shown to user before. 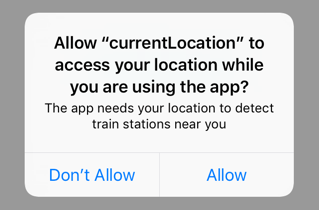 We will also have to check if the location services is enabled on the user phone (using CLLocationManager.locationServicesEnabled() ), user might have turned off location services capability on the device (globally, which affect all apps) but allow your app to access location data. In this case, the delegate method 'locationManager:didFailWithError:' will be called when the app tries to retrieve location data, with the kCLErrorDenied error code. After ensuring the location services is enabled and the authorization status is authorized, we can start to request location by calling locationManager.requestLocation() (one-time delivery of location data), or have an ongoing stream of location updates using locationManager.startUpdatingLocation(). 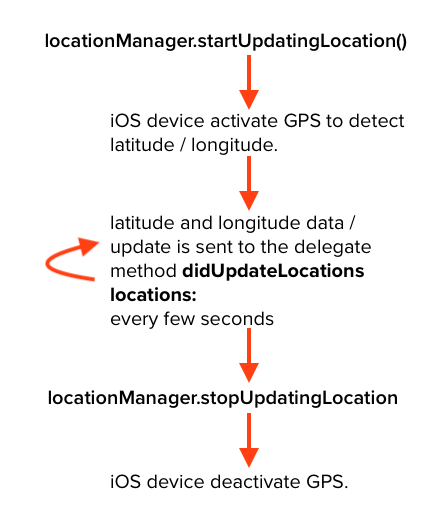 Both of these methods will instruct the iOS device to retrieve its current location data, and once the location data is retrieved, the delegate method didUpdateLocations locations: will be called. The difference is that .requestLocation() will only call the didUpdateLocations locations: once , whereas .startUpdatingLocation() will keep on calling didUpdateLocations locations: every few seconds or whenever there's location change until you stop it by calling locationManager.stopUpdatingLocation. didUpdateLocations locations: is called only once when we use .requestLocation. .requestLocation() will only pass one location to the didUpdateLocations locations array. didUpdateLocations locations: is called whenever there is update to location / every few seconds until we call locationManager.stopUpdatingLocation. .startUpdatingLocation() might pass more than one location to the didUpdateLocations locations array. 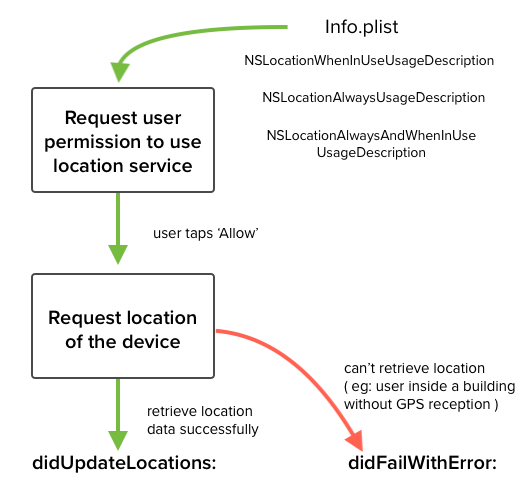 There might be a possibility that the app failed to retrieve location data (after calling .requestLocation or .startUpdatingLocation), when this happen, the didFailWithError error: will be called. The problem with this is that .requestWhenInUseAuthorization() is asynchronous, meaning after the permission alert is shown, the next line of code will be executed before user has tap on the alert. If you test CoreLocation functions in simulator, simulator will use simulated location data and return it almost instantly, as your Mac doesn't have GPS functionality. You can change the location coordinate for the simulator using Debug > Custom Location . If you test it in real device, it might take up to 10 seconds, depending on the accuracy you have set for the CLLocationManager. 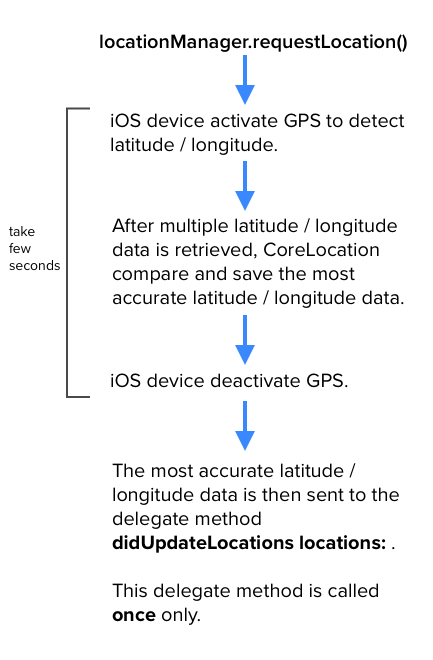 As mentioned in this WWDC video about CoreLocation (at around 11:55), requestLocation() is a convenient method provided by Apple which under the hood will run startUpdatingLocation() , retrieve multiple location data, and select the most accurate one to pass to delegate, and call stopUpdatingLocation(). This process can take up to 10 seconds (which is around the timeout limit) if it can't decide which location data is the best. If speed of retrieval is crucial for your app and you are willing to handle the start/stopping of location data retrieval and filtering of location data, use startUpdatingLocation() instead. You can specify how accurate you want the location data to be by specifying the desiredAccuracy property for the CLLocationManager before requesting location data. For iOS and macOS, the default value of this property is kCLLocationAccuracyBest. For watchOS, the default value is kCLLocationAccuracyHundredMeters. One thing to note is that higher accuracy will require longer time to retrieve location data. Using kCLLocationAccuracyHundredMeters to call requestLocation() took 1 second on my phone, whereas kCLLocationAccuracyBest took 10 seconds. I suggest to use the least accurate accuracy your app need (hundred meters is usually good enough unless your app is like Waze / Google Maps / Emergency app), this can save time on retrieving location. Start update location and that's it!